Tabberone's Hall of Shame - Blue Jean Teddy and Art Impressions Licensing. Sometimes companies just step in it. 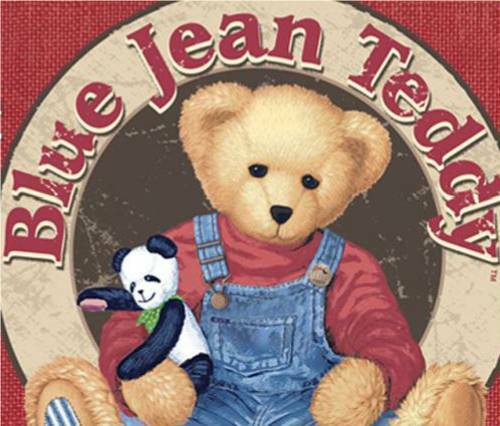 Blue Jean Teddy and Art Impressions Licensing match this description. If it weren't so pathetic it would be funny. What makes it pathetic is that people are being hurt by a clueless VeRO member (isn't that redundant?) who gloomed onto what he thought was a great idea only to have the First Sale Doctrine thrown in his face. Brad Bailey represents Art Impressions Licensing, who in turn represents Springs Industries, who in turn owns the rights to Blue Jean Teddy. Brad Bailey began shutting down auctions with Blue Jean Teddy in them. Why? He really doesn't know. So why did he start? He really doesn't know. First contact from Brad Bailey, who represents Art Impressions Licensing, was August 13, 2004. He shut down a whole lot of eBay auctions in one fell swoop. To his credit, he did contact sellers to establish communication. He must have been new at it or not a corporate lawyer. First Contact email from Brad Bailey wherein he states that he terminated some "47 auctions that vilolate (sic) existing license agreements". Huh? None of these people had licensing agreements with Blue Jean Teddy, Art Impressions Licensing, or Springs Industries. Perhaps what Brad Bailey, who represents Art Impressions Licensing, really meant was he figured these people were infringing upon existing copyrights and trademarks? Brad changes his tune after he finds out there is a "First Sale Doctrine". Someone directed to this web site where he got an education on trademarks and copyrights. Brad, don't you think you should have taken the time to get that education before you began ordering eBay to terminate auctions? Hmmmmm? Or perhaps talked to a few lawyers first? Brad's confused after reading this website. He wants to concentrate on items where they have licensing agreement and, maybe leave the others alone. Brad is clueless? Brad will have VeRO page as soon as he can get one set up with eBay. But, he still doesn't get it. It doesn't matter who has a license, the First Sale Doctrine still applies. Brad's head is not fastened properly. He says ceramic drawer pulls are not infringing when someone "creates" the image? Brad, you need to read more, a lot more. Springs Industries isn't sure what direction it really wants to go?. This is an example of an un-educated VeRO member run amok. It doesn't matter where Springs wants to go with this. It's a matter of what the law allows and Springs, like Brad Bailey, who represents Art Impressions Licensing, is like a headless chicken running in circles. The Springs Industries Web Site states, "** Licensed fabrics are not to be sold or purchased for the use of manufacturing pillows, bedding, clothing, crafts or any other products for resale. **" They don't get it. They are wrong. It looks like someone told Brad, "Stop the infringing auctions" without determining if Brad was qualified to do so. So, what else is new? To most VeRO members, a good faith belief is whatever they want to believe. The law and case histories just get in their way. Art Impressions Licensing is located at 23586 Calabasas Rd, Calabasas, CA 91302. Telephone is 818-591-0105. They list Cindy Bailey as CEO and Brad Bailey as Operations. Could Cindy and Brad be related? Since Brad doesn't appear to be too bright it's a good thing a family member helped him get this job.